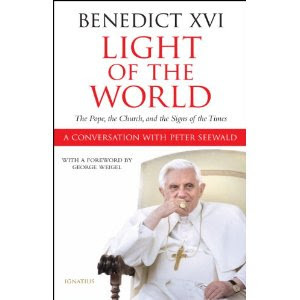 In July 2010, veteran journalist Peter Seewald spent six hours over six days engaged in an intimate conversation with Pope Benedict XVI. The carefully prepared questions along with their candid, thought-provoking answers are presented in Light of the World: The Pope, the Church, and the Signs of the Times. To say that this book is the most profoundly influential book I’ve read would be an understatement. When considering the text is put forward in a conversational tone, I expected this to be a fairly quick read. Instead I found myself reading and re-reading every question, every answer, carefully considering the meaning of each sentence - meditating on the concepts, the context, and the truths of what The Holy Father shared about our Church. As a “cradle Catholic” raised and catechized during the years when the “prevailing mentality was that the Church must not be a Church of laws but, rather, a Church of love,” I grew up knowing clearly that God Loves Me, yet as an adult I now recognize a deep-seated need to better know and understand my faith. This book is a positive step in that direction, as Pope Benedict, a “world-class intellectual” and “master catechist” provides very direct and honest answers to questions that challenge many of us struggling to find Christ in today’s secular world. Across 18 chapters, separated into three parts, the conversation touches on serious topics facing the world and our Church. When speaking of the Abuse Scandal and what caused it, Pope Benedict repeatedly uses the word “filth”… “darkening and soiling everything.” Regarding the global crisis of secularism, Pope Benedict carefully and clearly explains the dangers modern influences of progress and relativism have created in the world today. The question, “Why do faith and reason belong together?” reappears throughout the book. The middle part includes a closer look at the scope of the office, small and controversial decisions, his travels, new dialogues with Jews, Protestants, Orthodoxy, and Islam, and the Williamson affair. His discussions on Church, Faith, and Society, particularly the Catholic Church’s teachings on morality and addressing controversial topics where the world seems to be pulling apart from truth, marriage, sexuality, contraception, and the role of women in the Church are powerful and honest. He speaks of the Return of Jesus Christ and reminds us what Jesus wants from us. Every Christian should read this book with an open heart, to better understand the role of the Pope and Church. We received a copy of the book from The Maximus Group in return for this honest review.